The ‘Folds of Honor QuikTrip 500’ featured a special salute to fallen military service members on Lap 13. That lap was chosen because of the thirteen folds in the American flag given to families of fallen service men and women. Him we turn in times of peace as well as in time of war for His divine guidance. be found within or without the boundaries of our Republic. who have made this country great has been molded. and daughters for the defense of our country since they were first born. eternity and glorifies, in their eyes, God the Father, the Son and Holy Spirit. reminding us of our Nation's motto, "In God We Trust." After the Flag is completely folded and tucked in, it takes on the appearance of a cocked hat, ever reminding us of the soldiers who served under General George Washington, and the Sailors and Marines who served under Captain John Paul Jones, who were followed by their comrades and shipmates in the Armed Forces of the United States, preserving for us the rights, privileges, and freedoms we enjoy today. 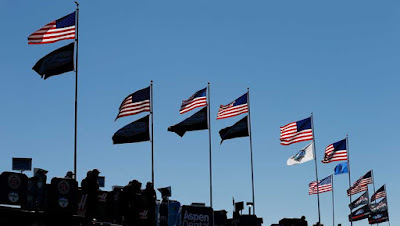 Fans attending today’s NASCAR Sprint Cup race at Atlanta Motor Speedway were asked to raise and hold replicas of folded American flags on Lap 13 in a show of honor. The event is also a fundraiser for Folds of Honor, a non-profit organization that helps to pay for the education of children and adults whose parents or spouses are killed or injured in military service. "Pilots are car nuts and watch nuts. When you go fast all the time, you want to go fast even when you're just driving around, it's such a drug," Faulkner-Brown, a family member taking part in the salute recallse with a laugh. "We were definitely racing fans and loved to drive fast cars, too." "The 10th fold in the flag is for the fathers," Faulkner-Brown explains further about the significance of the name Folds of Honor. Each of the 13 folds in a ceremonial flag has a specific meaning. "The sons and daughters give so much to their country, too. It's not just the service member who gives."